Starting up is the hardest time in the life of any type of electrical equipment. Ever notice that light bulbs almost always burn out when you first turn them on and not while they are on? This is due to the huge current that rushes in when a switch is thrown and power is first applied. Your air conditioner uses anywhere from 5 to 10 times more power on start-up than it does while running. With this burst of power comes a surge of heat that accompanies the electrical current. This heat damages the compressor, the terminals, the windings and run capacitor, all vital components of your air conditioner. The 5-2-1 compressor saver protects these components by significantly reducing the amount of time it takes for your compressor to start, in some cases up to 50%. This means your air conditioner and compressor will bear ½ the stress, strain and heat each and every time it starts. Considering that your air conditioner may start up more than 6,000 times in a single cooling season, the positive impact that the 5-2-1 compressor saver has on your air conditioner is significant. Before you replace your air conditioner, try adding a 5-2-1 compressor saver. The 5-2-1 compressor saver might save you from having to outlay thousands of dollars to buy a new air conditioner or compressor. 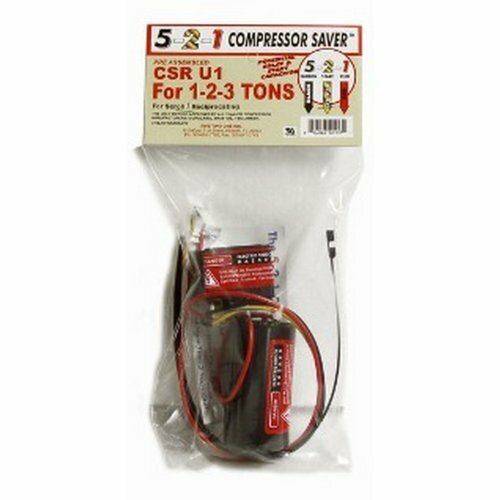 At a fraction of the cost, installing the 5-2-1 compressor saver is a wise investment. Air conditioners with the 5-2-1 Compressor Saver typically start in 30-50% less time than air conditioners without the product.